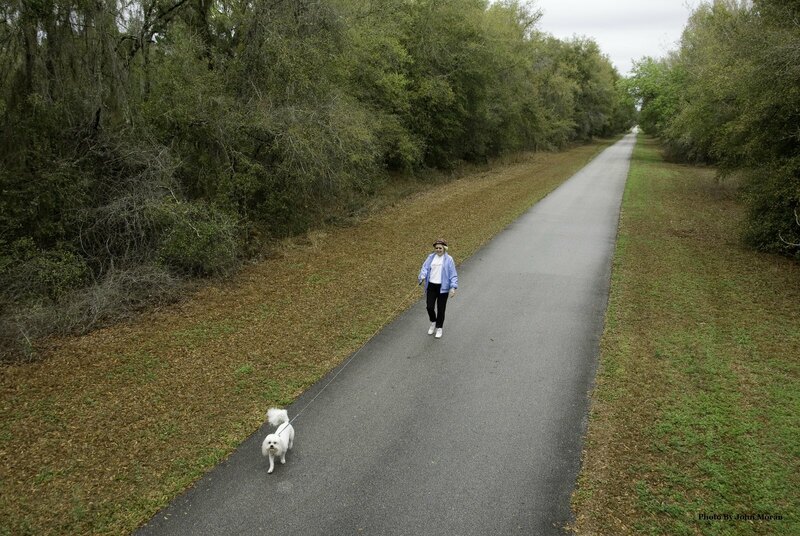 The Withlacoochee State Trail (WST), managed by the Florida Park Service, is the longest state-managed rail-trail in Florida, extending 46 miles from just south of Dunnellon in Citrus Springs to its southern terminus in the City of Trilby. The WST is a 12-foot wide, paved trail with an adjacent unpaved equestrian trail along portions of the paved trail. On railroad street one block west on CR 486 from the intersection of US Hwy 41 & CR 486 in Hernando. South of Dunnellon, off US 41, west on Martinelli Boulevard to Magenta, then south approximately 1/4 mile. Trailhead is on the right. In Citrus Springs, off of US 41, turn west on South Citrus Springs Boulevard approximately 1/4 mile. Trailhead is on left. Inverness Trailhead: (N 28.8406 W -82.3308) Once entering the Inverness city limits on Hwy. 41 South, proceed to North Apopka Avenue. Go left approximately 3/10 of a mile and look for a red caboose and signage for the Withlacoochee State Trail. From I-75, exit 301, take us 98/50. Head east on US 98/50 approximately one mile to Croom Rital Road. Take a left and proceed to trailhead. From Brooksville, take US 98/50 east to Croom Rital Road, approximately one mile past the I-75 Interchange. Take a left and proceed to trailhead. Trilby Trailhead: N 28.4627 W -82.1962 - Approximately 1 mile west of US 301 off US 98 on CR 575 in Trilby. 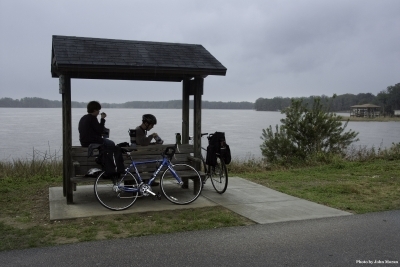 Owensboro Junction Trailhead/US 301: N 28.4459 W -82.1891 - From I-75, take exit 301 and head east on US98/50. At the US 98/50 Junction take US 98 southeast to US 301, then head south on US 301 approximately one mile to the parking area on the west (right) side of US 301. From US 301, the parking area is on the west side of US 301, approximately one mile south of the US 98/301 junction. In the late 1800s, an increase in phosphate mining activity in the area convinced railroad entrepreneur Henry Plant to extend his existing rail line from Tampa to Croom northward to Inverness to join Silver Springs, Ocala and Gulf Railroad, thus completing the Plant System's West Coast Route. The Plant System eventually became the Atlantic Coast Line in 1902, the Seaboard Coast Line in 1967, and finally, CSX Transportation in 1980. Due to a decline in railroad use beginning in the 1960s, service was abandoned and tracks removed on many thousands of miles of rail corridor nationwide. In December of 1989, CSX Transportation sold their 46 miles of right-of-way between Gulf Junction (Citrus Springs) and Owensboro Junction, six miles north of Dade City, to the State of Florida to establish the Withlacoochee State Trail. The route where rail passengers on the Southland and the West Coast Champion once traveled is now enjoyed by more than 300,000 hikers, bikers, skaters and horseback riders each year. 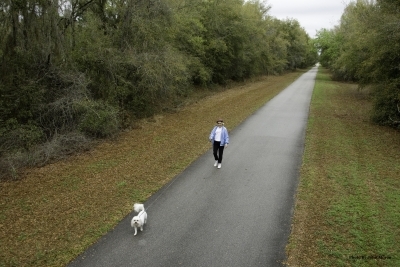 The corridor was one of the first purchased under the Florida Rails to Trails Program. 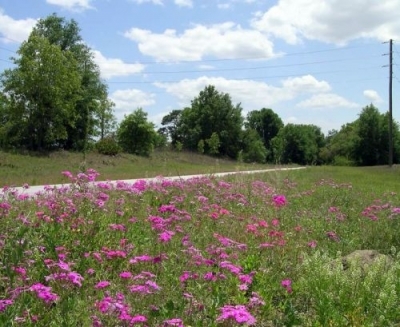 Managed by the Florida Park Service, the Withlacoochee State Trail is officially designated as part of Florida's Statewide System of Greenways and Trails. The 46-mile Withlacoochee State Trail (WST) is a 12-foot wide, paved trail. An unpaved equestrian trail parallels portions of the paved trail. The WST traverses three counties (Citrus, Hernando and Pasco) and offers an enjoyable, varied journey through small towns, ranches and natural communities. As it makes its way south from Citrus Springs to Trilby, the Trail seems to lead visitors back through time. The WST's northern trailhead is situated next to a modern, suburban setting while halfway down the Trail visitors have access to small towns that reflect the comfortable lifestyles of some forty years ago. As they approach the southern end of the Trail, visitors can drift yet another step back in time as the quaint, historic town of Trilby stands in peaceful contrast to the relatively nearby theme parks and bustling atmosphere of Central Florida. Like most rail-trails in Florida, the WST is generally flat, offering an easy ride for all skill levels. Reminders of the Trail's historic railroad activity include cement mileage and whistle markers, the Lake Henderson Trestle and the privately owned Inverness Depot which was built in 1982. The Trail's extremely dedicated citizen support organization (CSO), Rails to Trails of the Withlacoochee, relocated and restored a 1925 caboose for the Inverness trailhead. The red caboose now serves as a symbolic, welcoming landmark which volunteers hope will ultimately house a small museum of railroad memorabilia. The Withlacoochee's CSO has also enhanced the Trail with the installation of a 20-station health and fitness circuit near the Inverness trailhead and interpretive signage highlighting points of interest and natural resources along the Trail. The Withlacoochee State Trail is named for an Indian word meaning "crooked river." One of the Trail's most prominent natural features results from its intersection in several locations with the nearby Withlacoochee River's floodplain, which, along with scenic Lake Henderson and the Tsala-Apopka chain of lakes, attracts many species of birds. As it winds through six distinct natural communities, the WST offers rich opportunities for viewing wildlife. The diverse habitats of upland mixed forests, sand hill and wetland communities are home to gopher tortoises and other native plant and animal species. Transient wildlife species include bobcats, feral hogs, river otters, turkeys, deer, squirrels, and a great variety of snakes, birds and insects. 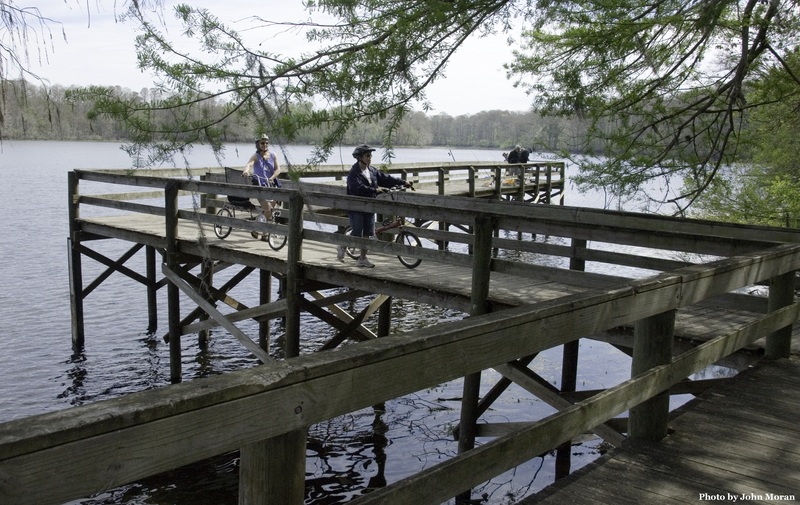 The Trail traverses a region that offers many other outstanding recreational opportunities. Among the recreational highlights nearby are the unpaved and motorized trails in the Croom area of the Withlacoochee State Forest; the Withlacoochee River (South) Canoe Trail; swimming and camping at Fort Cooper State Park; camping, fishing and boating at Silver Lake in the Withlacoochee State Forest; swimming at Hernando Beach County Park; a fishing pier at Wallace Brooks Parks; picnicking and river access at Nobleton Wayside Park and the Floral Park day use area. The WST will eventually join many other trails in the region, becoming part of the Heart of Florida Loop and the Coast to Coast Connector. 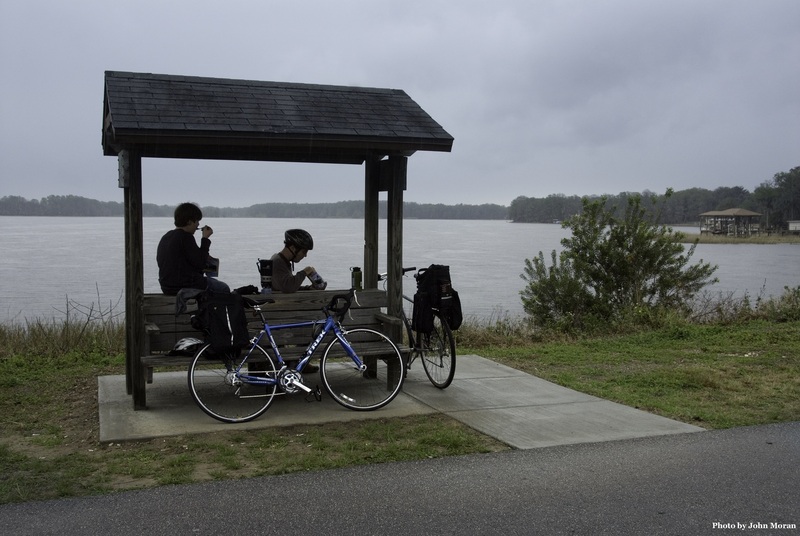 Rails to Trails Bike Ride – occurs annually, usually in October. 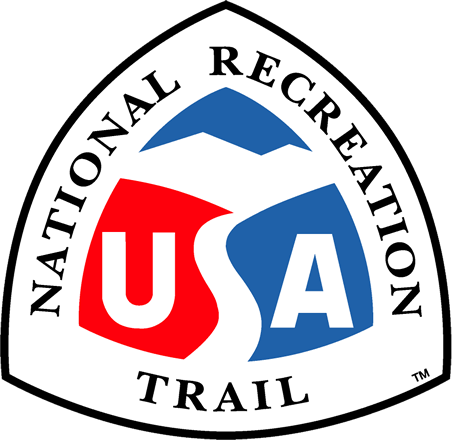 The event is sponsored by the Rails to Trails of the Withlacoochee, the trail's citizen support organization, as a way to raise funds for trail improvements. Participants can choose a 14-mile, 32-mile, 60-mile, or 92-mile route. There is also an eight-mile on-road option. In 2008, attendance was reported at 1,350. Visit railstotrailsonline.com for more information. Citrus County 5K Breast Cancer Walk - occurs annually, usually in October with approximately 200 participants. This event raises money for Citrus County breast cancer programs. Bike Ride for Human Life - occurs annually, usually in September with approximately 200 participants. Participants bike round trip from Inverness to Floral City on the Withlacoochee State Trail to raise funds for Citrus County Right-To-Life. Clean Air Bike Ride - occurs annually, usually in March with approximately 800 registered riders. Participants can choose a 14-mile, 28-mile, 48-mile, or 100-mile route. Proceeds from this event benefit the Key Trailing Center for Developmentally Disabled Adults in Citrus County. Visit cleanairride.com for more information. Firecracker 5K Run - occurs in July with approximately 200 participants. This event is part of the City of Inverness' Patriotic Evening event held in Liberty and Wallace Brooks Parks. Proceeds from this event benefit the Dream Society which provides assistance to physically disabled persons within Citrus County. Photo by FL Office of Greenways. Cyclists at River Landing. Photo by FL Office of Greenways. Dog walker on trail. Photo by FL Office of Greenways.